We are pleased to bring you the revolutionary Aeroscraft, which is changing air cargo transportation. Earlier this year, several months of exhaustive work by our dedicated Aeros team resulted in the successful testing of the prototype of the Aeroscraft. Our efforts have truly been a display of our passion. On-loading and off-loading a payload from the Aeroscraft requires only the pilot. No ground crew is necessary for cargo handling or any other aspect of the Aeroscraft’s flight. The Aeroscraft’s proprietary control-of-static-heaviness (COSH) system and CSCD system, together, automate weight-balancing and permit terrestrial or marine cargo deployment. The design configuration will allow fast and precise cargo on-loading and off-loading from hover – even in austere environments. The Aeroscraft is capable of hovering over a target for hours. The air cargo logistics industry has a long-sought a solution for modern global transport logistics challenges. The Aeroscraft introduces a new paradigm in air cargo logistics. The Aeroscraft better addresses macroeconomic trends and the new 21st Century cargo realities of just-in-time order variability, decreased order cycle time, increased demand cyclicality, and more dispersed destinations for delivery of finished goods. It’s a technology-empowered solution that combines the benefits and flight characteristics of fixed-wing, rotary and traditional LTA vehicles. To accommodate global trends, the Aeroscraft has been designed to usher in a new flexible routing alternative. It provides a vertical-lift global transportation system without requiring the infrastructure or ground personnel historically associated with aircrafts. The Aeroscraft will facilitate rapid and direct delivery of cargo to virtually any point on the globe, reaching austere locations and resources previously inaccessible and providing business opportunities that may have been previously deemed unprofitable. The Aeroscraft’s VTOL capabilities and freedom from infrastructure dependencies (such as ports, airports, highways, railroads, and intermodal unloading stations) will facilitate delivery to locations lacking infrastructure. The Aeroscraft is a new unimodal solution to an intermodal cargo logistics universe. The Aeroscraft also elevates intermodal logistics by providing a new ship-to-shore delivery capability that bypasses ports and a new hover-deployment capability that can overcome the pain points involved with both marine and terrestrial mega-engineering projects. The vehicle’s massive cargo compartment is designed not just to accommodate high-value project cargo like aerospace components and equipment for wind farms, but will also help modular construction by lessening the final assembly requirements at project sites, and by lessening commercial disassembly and reassembly requirements that are costly in terms of time and labor. Another way to understand the Aeroscraft’s VTOL capability is to compare the Aeroscraft to a submarine. For example, when a submarine needs to dive into the water, it takes on water to make it heavier. When the submarine needs to surface, it releases that water to become lighter. Similarly, the Aeroscraft can control its weight by releasing and taking on air, controlling the heaviness or lightness of the vehicle. One obstacle that conventional and hybrid airships face are their inability to control buoyancy without venting helium. Another operational challenge faced by airships and hybrid airships is the inability to control or adjust static lift during operations. Traditional airships’ requirement for external ballast exchange and existing ground infrastructure has significantly limited their cargo utility. Once the cargo is off-loaded, traditional helium-dependent airships become extremely light, and this static lift causes them to float away. To combat these forces, they require external ballast exchange, using rocks, ice, water, or lead bags, to keep the airship anchored to the ground. Because the Aeroscraft is equipped with VTOL capability, it can deliver cargo directly from point-of-origin to point-of-need. 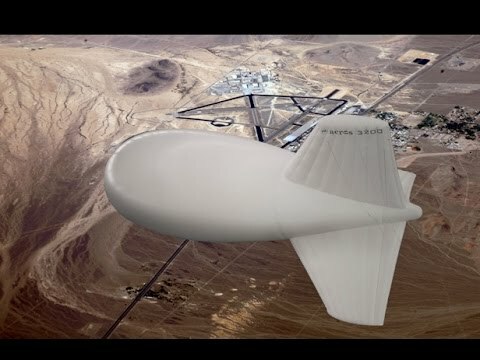 Furthermore, other hybrid airships are runway dependent at higher operating weights, but the Aeroscraft does not need a runway, even at full payload. Because of its innovative COSH technology, its computer-controlled virtually-automated directional thrust and station-keeping technology facilitates off and on-loading stores while in hover. While the technology of the Aeroscraft is impressive in its own right, it is the cargo bay that provides game-changing economic benefits. The cargo bay is located at the bottom of the aircraft cavity and is loaded by using a pulley system to load the cargo from the ground. The cargo bay of the largest Aeroscraft is much larger than any bay container in any commercial freight aircraft carrier today (including the Boeing 747-8F and the Antonov 124 aircraft). It is because of the cargo bay that the Aeroscraft is a perfect vehicle for transporting large, oversized items that are normally difficult to transport by air and ground corridors. Items can now be shipped from point-of-origin to point-of-need, without the usual difficulties of traditional ground and air transportation.